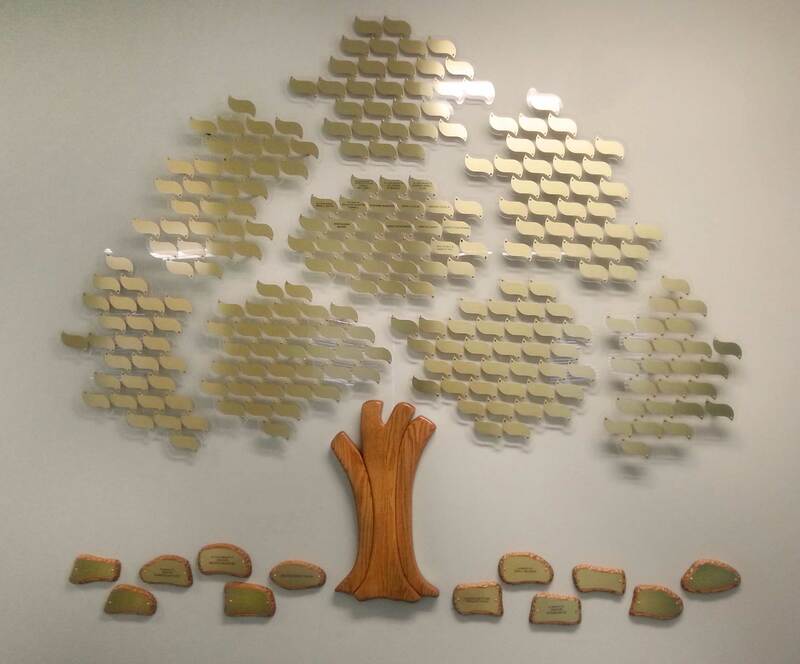 The bases, fabricated from multiple layers of angled oak, anchor 500 - 2" x 4" leaves mounted on 3/8" Plexiglas leaves. 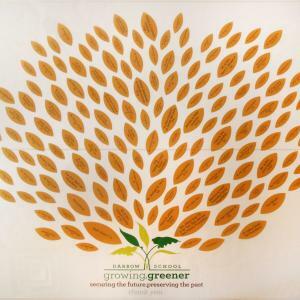 The tree is designed for future growth. 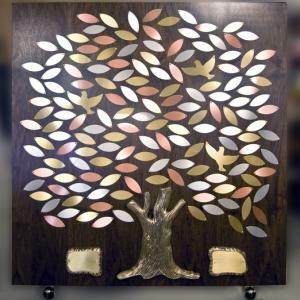 Wood tree base, 3 plexiglas islands with multi color 100 - 1 1/2" x 3 1/2" brass, aluminum and copper leaves. 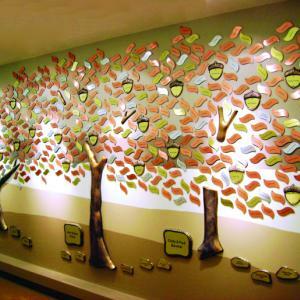 Large donor wall with three trees. 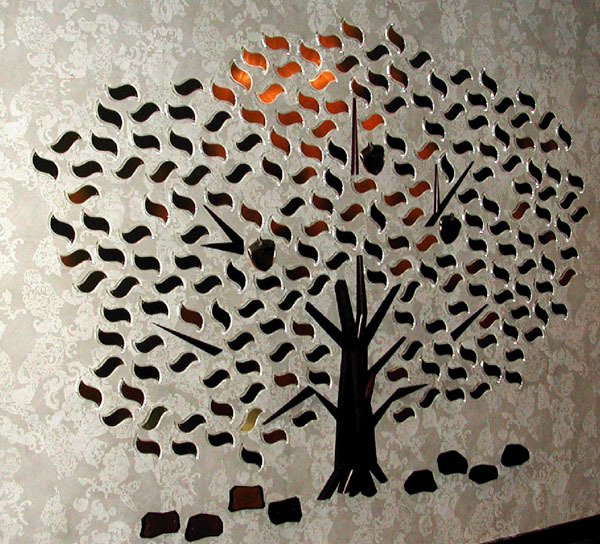 500 - 2" x 4" brass, aluminum and copper leaves mounted on a mural painted on a sheetrock covered plywood wall. 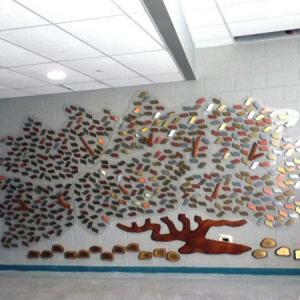 Acorns and rocks provide additional space for donors. 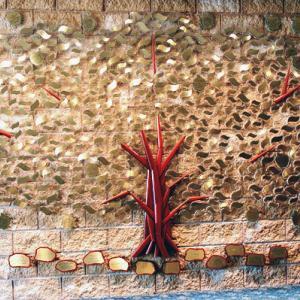 The bases and branches are sculptured cast bronze with a hand rubbed oxidized finish. 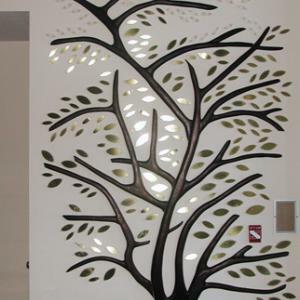 The base, fabricated from multiple layers of angled mahogany, anchors this 200 - 2"� x 4"� leaf design. 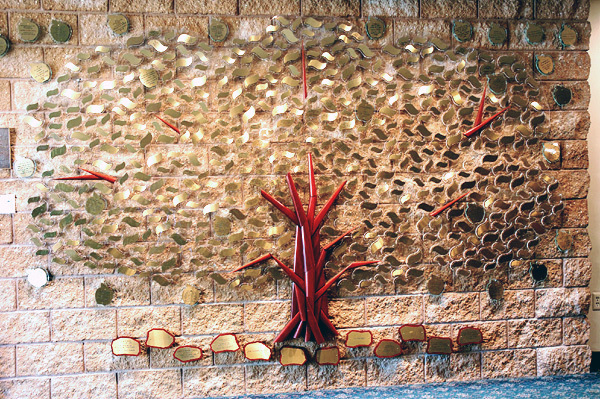 Mahogany branches and bronze and brass acorns are dispersed through the Plexiglas mounted brass leaves. 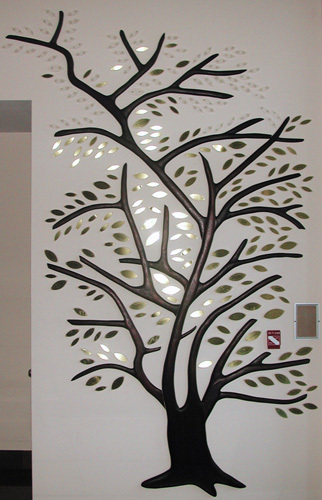 250 satin brass leaves, in 3 sizes, are mounted on individual Plexiglas leaves. The hand carved mahogany base and branches has a rounded, smooth finish. 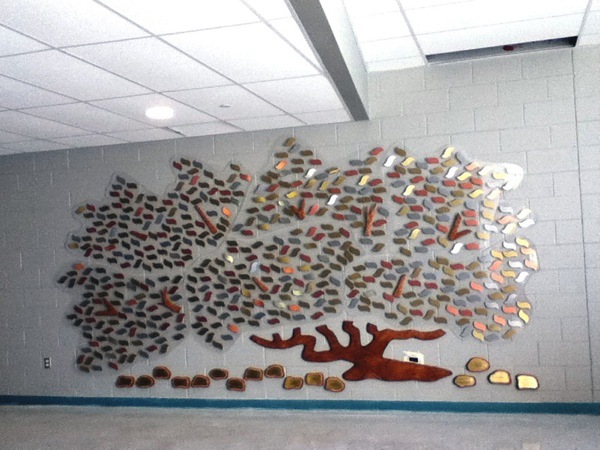 400 brass, aluminum and copper leaves are mounted in a scatter leaf pattern to multi elevational Plexiglas islands. The base, branches and rocks are carved mahogany. 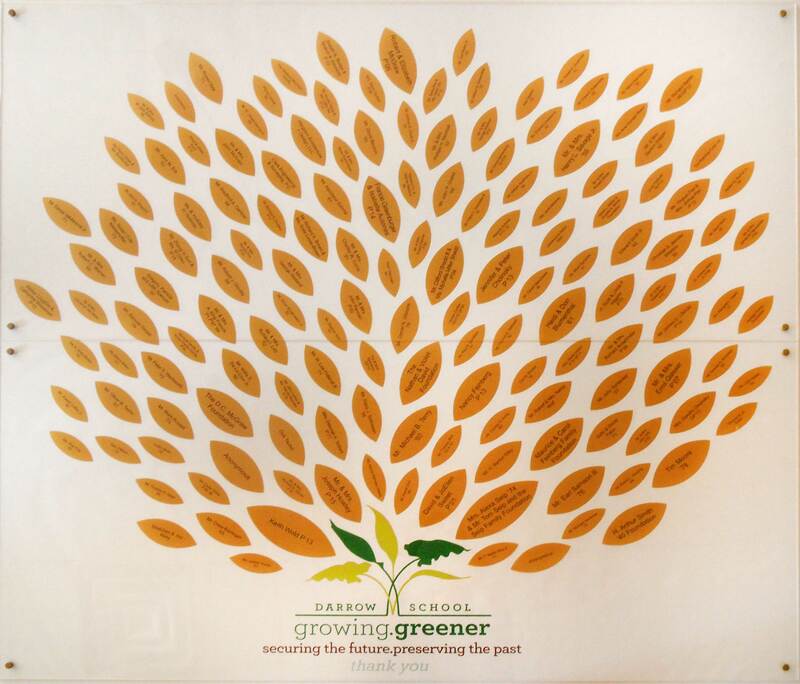 80” x 47 x 3/8” acrylic panel with a graphic donor tree design and wording printed on the back. 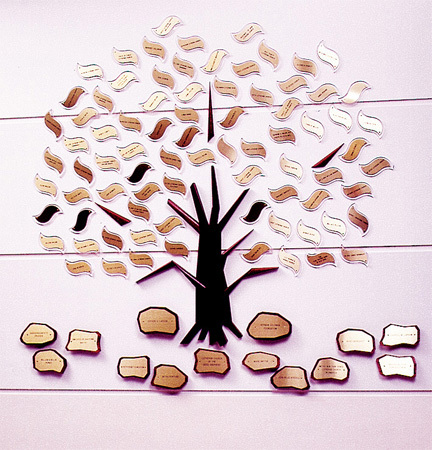 The acrylic is pre-drilled to accommodate 150 - 1 1/2" x 3 1/2” metal dedication leaves. The acrylic panel is mounted on 1/2” risers and aluminum button rosettes. 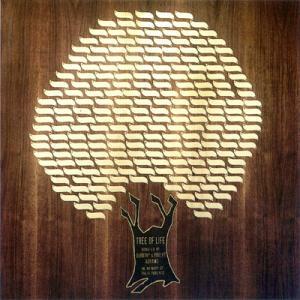 250 - 1 1/2" x 3 1/2" brass leaves mounted to 1/4" clear plexiglas islands, with a wood tree base. 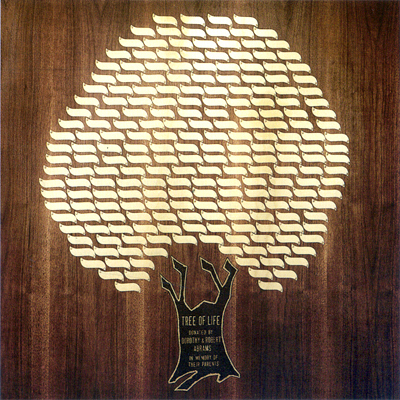 The base is oak, stained golden oak. 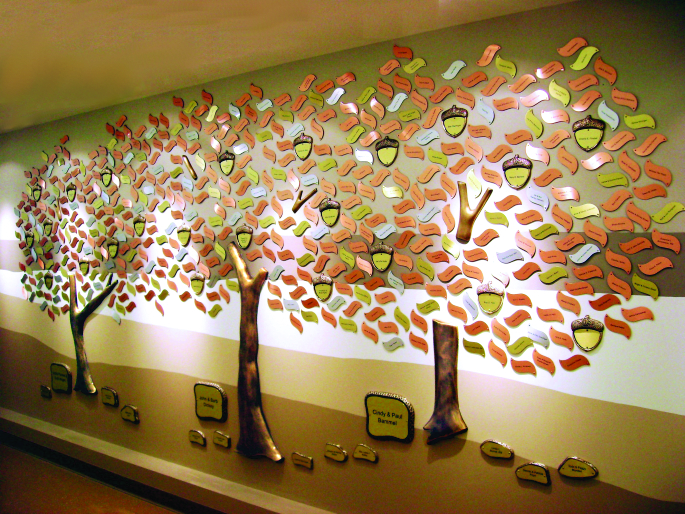 The overall size of the tree is approximately 60” x 73"
150 Vintage Gold acrylic leaves are mounted to flush Plexiglas leaves. 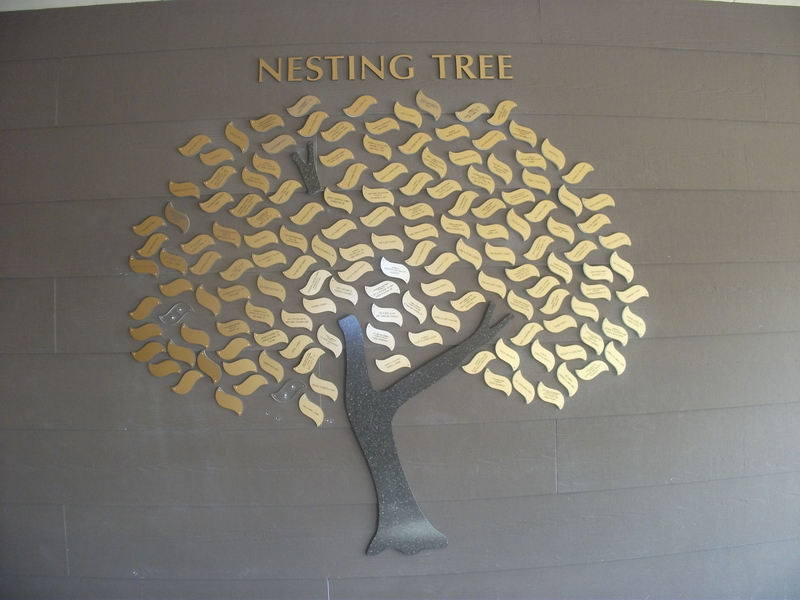 The Nesting Tree donor tree base and branch are thick Coca Brown Corian. Individual� Vintage Gold acrylic title letters are laminated to black Sintra. All materials are rated for outdoor use. 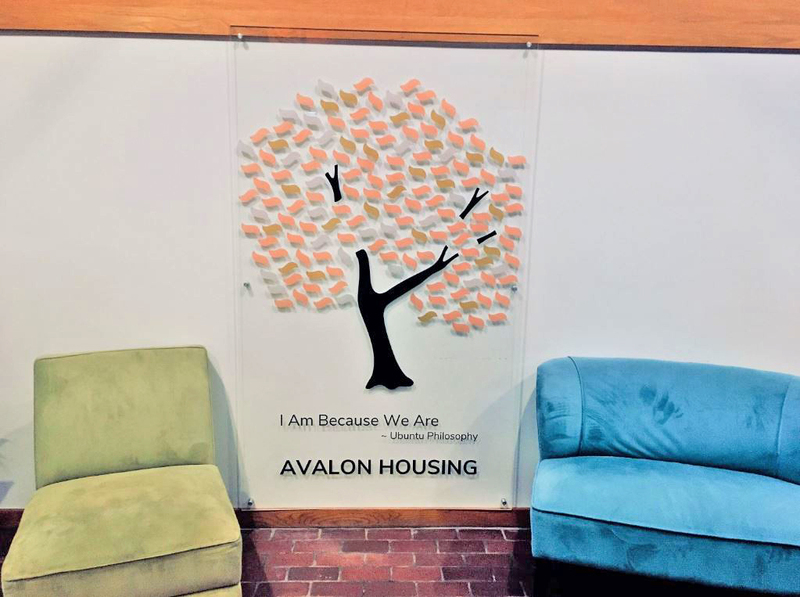 80 - 2" x 4" satin brass leaves mounted on individual Plexiglas leaves. Multi elevational hand carved mahogany base and branches with a rounded, smooth finish. 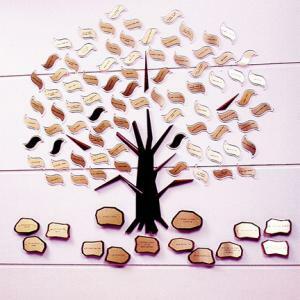 2 sizes of brass and mahogany rocks recognize large donations. 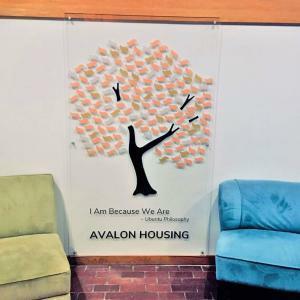 500 - 2" x 4" brass leaves, mounted to individual Plexiglas leaves on interlocking Plexiglas islands. 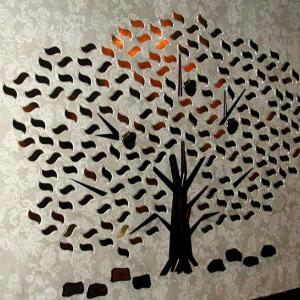 This allows the Donor Tree to be mounted to an irregular stone wall. The multi layered base is mahogany. 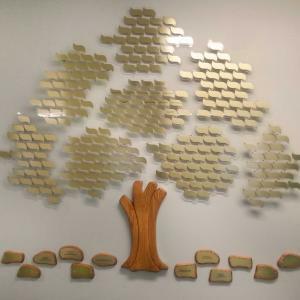 Plexiglas and brass apples along with mahogany and brass rocks recognize larger donations. 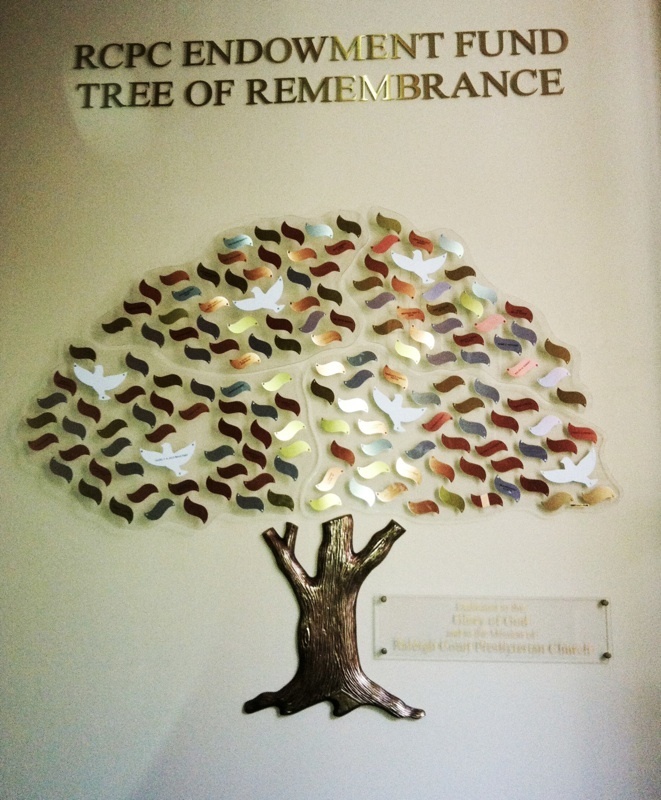 Lebanese Tree of Life design with hand-carved dark oak base and branches. Brass oval leaves mounted to medium stained oak islands. 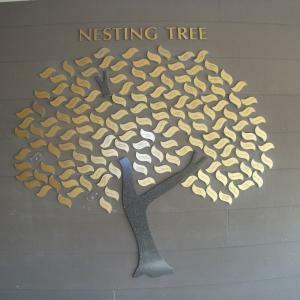 11 brass and oak rocks anchor the tree. 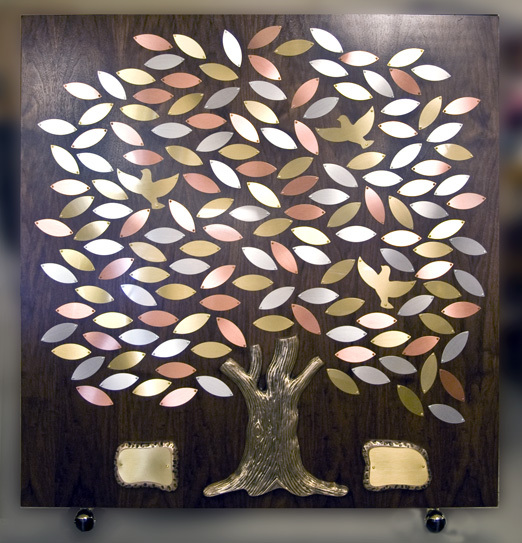 220 - 1" x 3" brass leaves are mounted on a 4' x 4' framed walnut or oak background. The inscribed base is cast bronze. 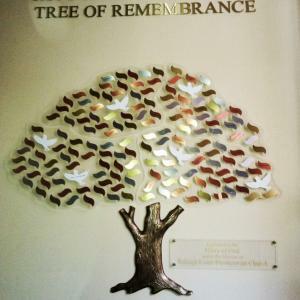 Portable donor recognition tree with 150 - 1 1/2" x 4 brass, aluminum and copper leaves and 3 brass doves are mounted to a portable walnut background. A cast bronze base and rocks anchor the design.